“Today, we have taken the final major step toward ending the discriminatory ‘Don’t Ask, Don’t Tell’ law that undermines our military readiness and violates American principles of fairness and equality. In accordance with the legislation that I signed into law last December, I have certified and notified Congress that the requirements for repeal have been met. ‘Don’t Ask, Don’t Tell’ will end, once and for all, in 60 days — on September 20, 2011. “As Commander in Chief, I have always been confident that our dedicated men and women in uniform would transition to a new policy in an orderly manner that preserves unit cohesion, recruitment, retention and military effectiveness. Today’s action follows extensive training of our military personnel and certification by Secretary Panetta and Admiral Mullen that our military is ready for repeal. As of September 20th, service members will no longer be forced to hide who they are in order to serve our country. Our military will no longer be deprived of the talents and skills of patriotic Americans just because they happen to be gay or lesbian. MSNBC: The Pentagon will announce Friday that Defense Secretary Leon Panetta and the Joint Chiefs have certified that the military is ready to end “Don’t Ask Don’t Tell,” the policy preventing gays from openly serving, senior defense officials tell NBC News. 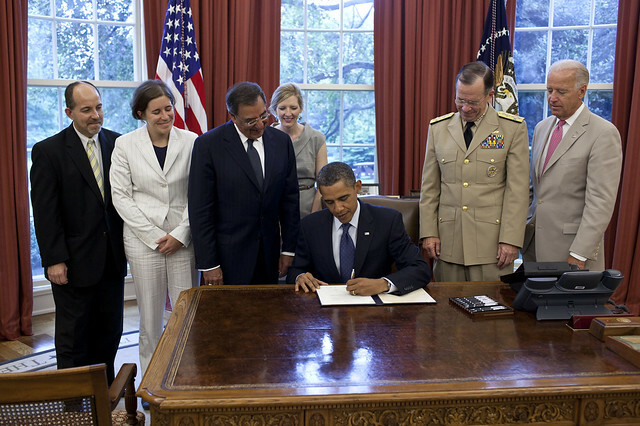 Each member of the Joint Chiefs had to submit a recommendation to Panetta, indicating that they are far enough in their training to repeal DADT, and that it will not have an impact on military readiness. The next step is for President Barack Obama to certify the repeal, which then begins a 60-day waiting period to implement the repeal — before “Don’t Ask Don’t Tell” is officially a thing of the past. The Pentagon has been in the process of writing rules for the new policy, and Friday’s announcement will clear another hurdle toward repeal…..